In any UI, calls to action must be clear - represented either by intuitively labeled buttons, or instantly recognizable icons. When they're not, your users will have to do extra work to figure out how a feature works, how to get started, how to distinguish areas of the screen. This will cause them to hesitate, be confused, and simply take more time than needed to get something done. And they'll most likely forget next time they visit your app. 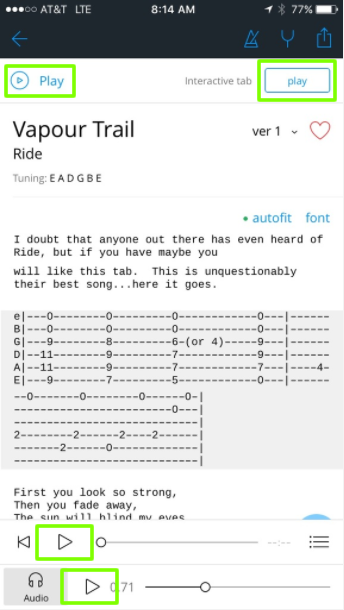 In the case of Ultimate Guitar, an excellent guitar community website which includes chords (and tabs) from 1000s of songs, the detailed view of a songs's chords have too many similar calls to action. In the image above, notice the number of tappable elements that represent 'Play'. The first and second one (top of screen) seem to do the same thing - they briefly open a different, more robust view of the tabs, followed quickly by a modal asking me to upgrade. Not only are the options redundant but only the second one has a label 'interactive tab'. The third, a play icon, only displays when I tap the Audio button and plays the song via an integration with Apple Music (super useful!). But the identical play icon below that (the fourth) does something totally different than the third - it scrolls the page slowly helping the user play along with the tabs. As the audio controls (for playing the song) collapse, the user sees only one pause button, on the same row as the Audio icon, which makes it unclear what the visible play/pause control relates to (is it for scrolling? for playing the song?). On the top, remove both of the play buttons, and convert the 'Interactive Tab' text to a button, top right giving the user only one clearly labeled play option. This will also remove some clutter, making the screen less dense, letting the user focus on what's important. On the bottom, consider using the same gray background (used for the active Audio button), for its related play/pause controls in the above row, leaving the scrolling controls white. The slight variation in color across rows will help users distinguish the one set of controls from the other while the gray color will establish a visual relationship between the Audio button and its controls.